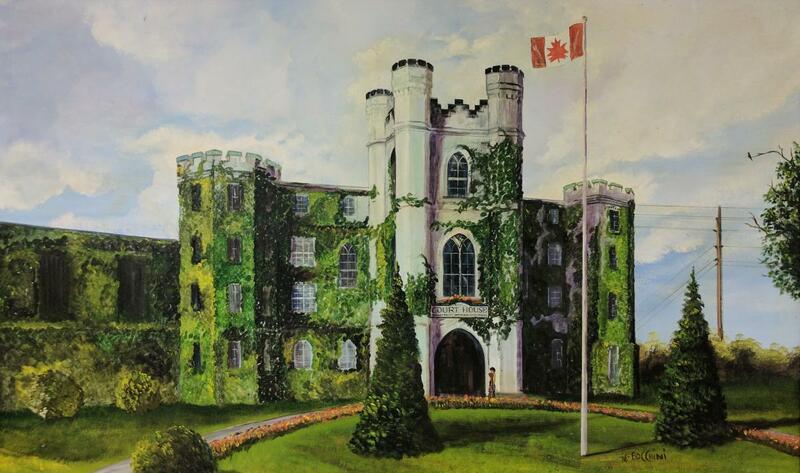 This painting was donated to the County of Middlesex by Lorna Kutchaw in Memory of Her Husband J.H. (Gus) Kutchaw, the Last Superintendent of Middlesex County Gaol housed in this building. This work was created by V. Bocchini, who was in custody at the time. Middlesex County is offering an exclusive behind the scenes look at one of the most iconic buildings in London with the launch of their new interactive 360º virtual tour of the Middlesex County Administrative Building, otherwise known as London’s Old Courthouse. The virtual tour combines video, pictures and text, including brief historical backgrounds, for full immersion into the building’s historic interior. The tour is self guided; the user can click to enter or exit rooms and use the cursor to change their viewpoint and angle of the rooms. The rooms available for tour include the preserved jail cells, as well as the present Council Chambers that served as London’s courthouse from 1829-1974, and hosted such cases as the Upper Canada Riots and the Black Donellys. The tour can be accessed by clicking here.